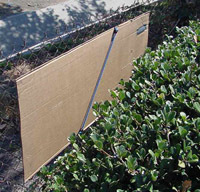 Place sign against fencing and strap in place with a bungee cord or two. Don't restrict yourself to overpasses - any fencing you can see from the freeway is a place you can put a sign. 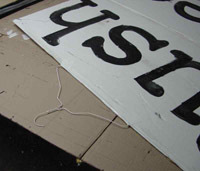 Duct tape coat hangars to the top of sign, entangle loops in fencing. Strap in place with large bungee cords. For more details "Placement Strategies"
Placement: Anything you can see while driving is a place you can put a sign. The more difficult it is to reach, the longer it'll stay up. Tens, even hundreds of thousands of people can drive by a sign before one of them takes so much as five minutes to go take it down. Apart from actual prisoners, you won't find a more captive audience than people in their cars. Safety First: Like anything else, free speech is fun until someone gets hurt. Signs should be placed on the INSIDE of fencing, NOT suspended directly over traffic. So long as your letters are at least six inches tall, they'll be perfectly legible through the fencing. "How do you get the lettering so big?" Overhead Projector. I print the text on a transparency from my computer, shine it on the cardboard (painted white) and trace the letters with a marking pen. Then I lay it flat and fill in the letters with cheap enamel and a small foam brush. The reason I don't play up the overhead projector method more is that I don't want people thinking: "Once I get my hands on one of those projectors, by golly, then I'll do it!" The most important sign to put up is the first one - it almost doesn't matter what it says or how it looks, just so long as it gets done. Soon. There'll be plenty of time to make signs that are prettier and wittier in the future, but the first one has to be done now. "How long do they stay up? Who takes them down?" I've had some signs stay up for minutes, others for months, depending largely on what they say and where I put them. In general, large ones come down fast, smaller ones not so. I feature larger signs on the site because they look cooler, but by far the majority of, and I believe the most effective, signs I post are small reminders along the peripheries of the freeway such as "The War is a Lie." or "Osama Bin Forgotten". As long as the letters are at least eight or nine inches tall, people will be able to read them just fine. Unlike overpasses, signs posted along the peripheries of the freeway are easier and more discreet to post, and can stay up for days. Who takes them down? Cops, highway workers and Republicans I suppose. So long as you can keep putting them up, it really doesn't matter. "Does it do any good? Does it really change anyone's mind?" I don't know. I started doing this because I got tired of listening to the political debate in my country being framed by a bunch of pompous windbags and megalomanic clowns on my radio and TV. I started doing it because I was pissed-off feeling like I didn't have a voice in that debate, and to the extent I did, having that voice be filtered through corporate editors. In that sense it has changed at least one person's mind: mine. Signposting has taught me that I Do have a voice, and more important, so do you.